Hi Janice. I had one of these way back when they were new and was problems from the start out of the box. Dry solder joints on the motor speed control circuit board and eventually the micro switches packed in which are located left and right behind the main control knob. I would start by changing the two micro switches you can see which is a fiddly job but my money would be on them and probably the one to the right. Thanks Lee for the advice...and Pete, I'm going out of town this weekend to visit family and celebrate Father's Day with my step dad. I'll be back on Monday. I will have my laptop with me..so if you post a test I should do...I'll do it when I get back. Pete...I'm back home now and ready to work on the projector. Were you going to guide me through some testing? I just want to make sure this time that I'm clear on the components I'm suppose to be testing:) I will probably verify by posting a photo. I also need to test to hopefully identify what blew out this last time. I'll take a look at it tonight (Australia time) and write something up for you. Hi Pete...I PM'd you. When I blew out the sound on my last testing...could this have blown a fuse. I don't see any tube type fuses on this machine, but Steve says it has to have fuses. Where are they? Sorry Janice, I haven't forgotten you, I unexpectedly ended up away from home until this morning. 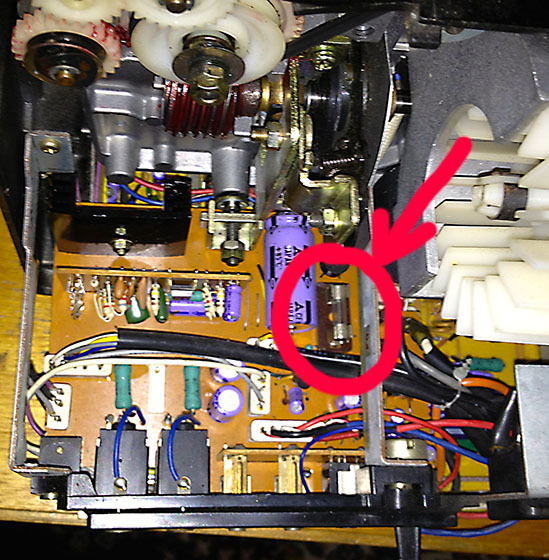 Circled in red is the fuse on that board, it is next to the huge capacitor. Make sure the projector has been turned off and disconnected from the power for a few hours at least to let the capacitors discharge so they don't zap you! The capacitor is the same size. Someone may have replaced the fuse with a wire at some point. Not good! I can get the meter out the day after tomorrow and record some test points for you to follow along with, I'll video it if I can. Just remember to be careful, there is 220v kicking around! It makes it easier to avoid short circuits. Great Pete...I'll see if I can pick up those hooked probes at Radio Shack today. *Got them*... These are great...wish I had had these before...much safer. I WILL be careful though. I noticed Pete that you have the speaker wires disconnected in your photo. It would be nice to not have the back cover attached to give easier access to the components. Does the connector remove as one piece by just lifting it up? I don't want to mess with it unless I know more about how it's connected. Yes, you can just unplug it. I think there is a small hidden glass line-fuse inside the wiring loom, somewhere behind the power socket. Its covered in black plastic tubing so you will need to cut it out when you find it. Also check the motherboard visually for burnt out printed circuitry. I'll look for the fuse Frank. I may have blown that with my failed testing incident. UPDATE: Frank other than the fuse location Pete shows in his photo, which is missing on my machine...I don't see another fuse anywhere...and nothing in the power socket area. Just going over the projector now with the meter to follow the path of the power and come up with some test points for you. Sorry it has taken so long, I unexpectedly lost both Grandmothers within days of each other, it has been an up and down week. First thing to check is that power is getting to the main board. With the power cord *disconnected* open up the projector, and lay it down carefully so that the front is face down on the table. 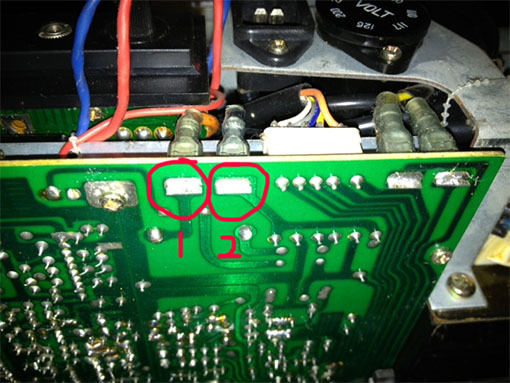 Check the bottom of the green PC board for any scorch marks or damage. 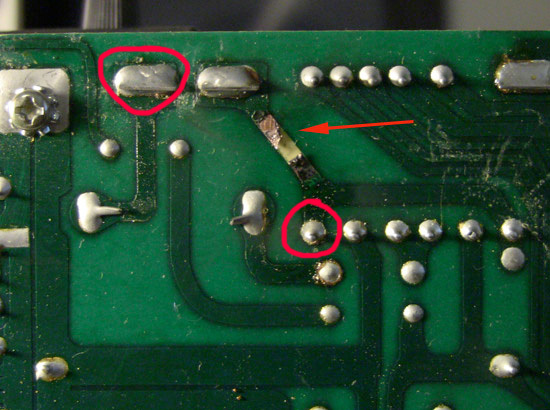 If it is clean then attach your test probes to the bottom of the board where the 15V AC comes to the board. On mine the wires are Orange and black. Set your voltmeter to AC voltage (~) and if it is not autoranging, set it to above 200V in case there is a short. 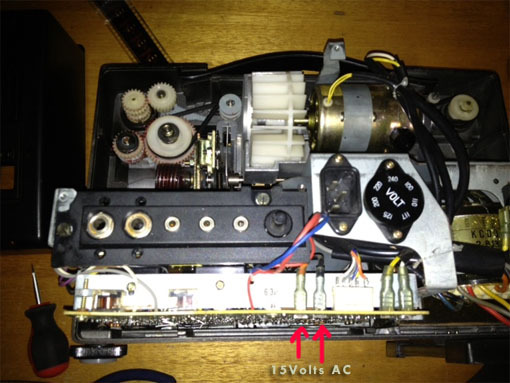 Apply the power and the voltmeter should read approximately 15V AC. It doesn't matter which way around the probes are. If that voltage isn't present, then either there is a hidden fuse, or the main transformer is burned out, or one of the wires has burned out. It is a good first place to check. This doesn't look good to me Pete...and no voltage reading. What do you think? Janice, I had similar issues on my ST-1200 PCB ..... only worse. So I got a friend and we soldered wires where we felt the connections had corroded. Take a look at the image here: Link. I can reply with more details, if you want. Well... I guess the good news is that we know one reason it isn't powering up! Before soldering anything, put the test probes on the points I have circled and we can see if the 15V is getting to the board at all. 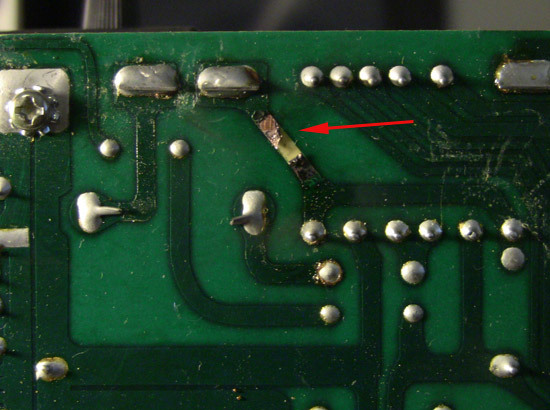 If those test points show 15V AC, then it is easy to solder a wire in place of the burned out PCB track. I'm 99sure that you will still have no voltage there though. If no voltage is showing, then we need to physically trace the wire on the right-hand-side (the black one) and see where it goes and if there is a fuse hidden along it somewhere, or if the wire itself has burned out. If the Transformer is okay, then anything else is a relatively cheap fix. Don't lose heart! 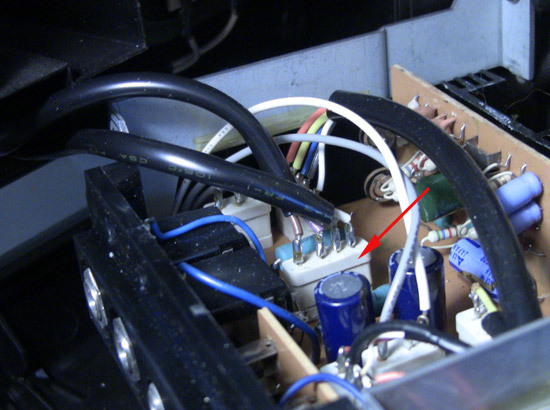 The likely culprits will be the Toshiba 1B2Z1 rectifier (green oblong thing behind the power input) or the filter cpacitors. Pete...do you have the schematics? 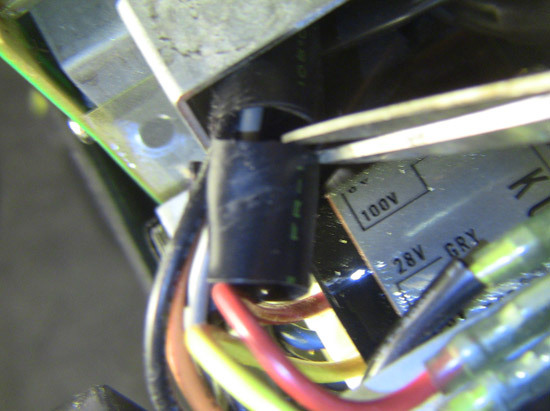 The black wire leads directly to the transformer. According to the schematics it should go to a fuse first ... but there is no fuse. It's strange that this machine looks hardly used, but has so much damage. I'm taking a break today to celebrate Independence day by going to a 4th of July BBQ Let me know what else I need to check...I'll do it tomorrow. Are you sure the wire goes straight to the transformer? On mine it looks like it does, but actually doesn't. The wire is encased inside a black plastic 'shroud' and hidden inside that is the fuse. I don't have the schematics unfortunately. The next thing to check *with the power disconnected* is to trace the wires from the back of the power socket to the transformer and check if they are damaged or if there is an in-line fuse that has blown. The ST-1200 Repair Manual was very useful while working on my PCB. It gives voltages at almost all points, so we could identify the ones that needed soldering. Helped finish the job in one night. Here, we have a back-and-forth across continents, so it is going to take time. Nevertheless, this is an invaluable thread. That manual was on sale last week for $15 :-(...I almost bought it...now I'm kicking myself. However Pete, I have the schematics that Maurizio Di Cintiot scanned and sent me and I can email them to you if you like. Maybe he has the whole manual too. I want to make sure I'm checking the correct wires for the fuse. I cut back some of the tubing enough to slide it back and forth on the wires. There was no fuse in this section of wires. As far as checking the wires from the socket to the transformer...that's a bit tricky. I guessing I have to take off that section of the chassis to get a good view of the wires. With a flashlight some of the wires going into the top of the transformer don't look just right...but it's such a small opening it's hard to tell for sure. I see 4 screws that are holding the chassis in place. I can remove these screws and I'll probably have to remove some wiring that is cable tied to the chassis. What do you think? Is there a way I can test if the transformer is getting any power? There sure is. See the Red and yellow wires going to the Switch on the far right in your photo (The 'H' switch for the lamp). Disconnect the power and then pull the red and yellow wires off the switch. Set your meter to AC Volts and place the red probe into the red wire (You should be able to poke it in the end of it into the spade connector). 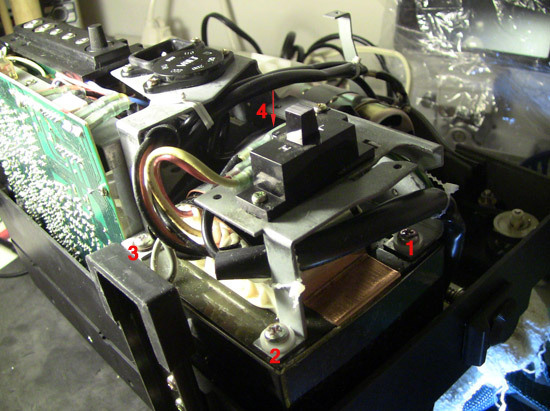 Connect the black probe to the metal chassis of the projector. Plug the projector in and check the voltage on the meter. It should be around 11V AC on the red wire. 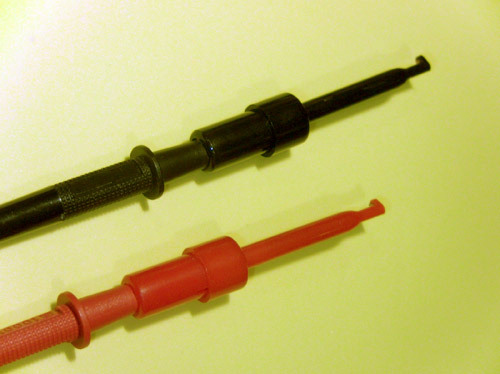 Leave the black probe connected to the chassis and stick the red probe into the yellow wire. There should be about 9V AC on the Yellow wire. (Mine are 11.3 and 9.3 respectively). If there is nothing on those, then check that the power cable to the projector is working by using it (and the same wall socket) on another device like an electric kettle or a computer as they usually use the same shape plug. If the power cable and wall socket are OK but the voltages are zero, then the transformer is blown or the wires from the AC socket to the transformer are faulty. So Pete you are saying it could be the transformer or the wires. Then my totally uneducated guess is the wires. Since the light did work before I blew out something. Is it an all or nothing situation where the transformer either works or it doesn't? OR can some parts work and others not? ... i.e. power gets to the lights through the transformer...but not to the motor? Is there a possiblity I blew the transformer, since I can't seem to locate any fuses? A few ways to find out. Easiest first, from you location I am guessing you are on 110v? The power goes into the projector via the power socket. From the back of the socket there is a blue wire that goes straight to the transformer, and a brown wire that goes into the Round Voltage Selector. 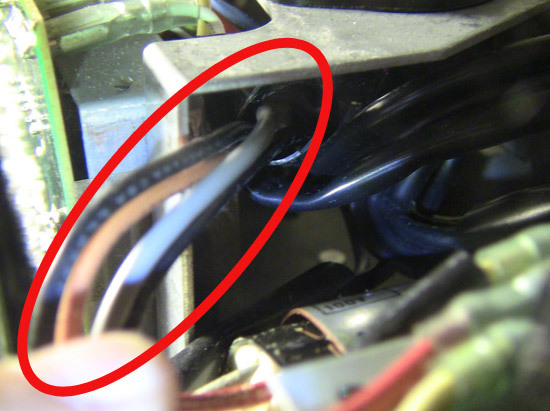 Various wires come out from the voltage selector to the transformer depending on the selected voltage. 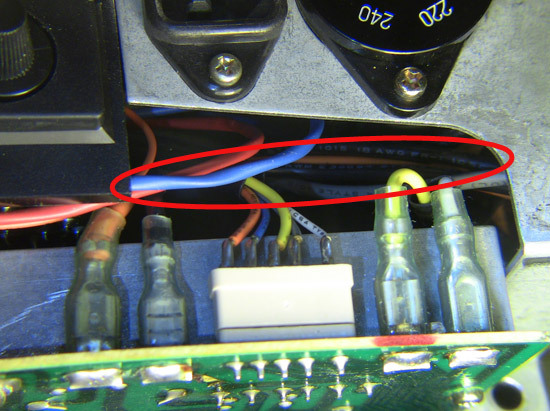 So one thing to try, if you are on 110V, remove the pwer cable, then remove voltage selector disc by pulling it straight up, and change the voltage selection to 117V. This would cause the projector to run at the wrong speed but won't damage anything. Do that then test your voltages again. 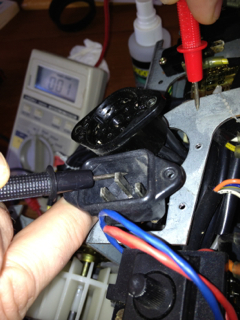 This will at least check if the wire from the back of the voltage selector to the transformer has burned out. (also check the volatge selector disc for signs of damage when you remove it). 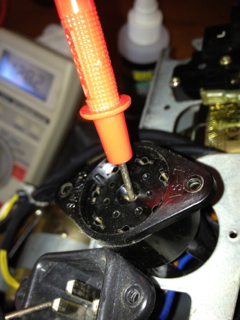 If there is still no voltage present, then remove the power cable. Undo the two screws holding the power socket in, and the two screws holding the voltage selector. You can now pull both of these up to inspect the wires behind them and look for damage. My projector is now in pieces everywhere too! If you can't see any damage then we can check for continuity by testing from the power socket to the centre pin of the voltage selector, and from the earth pin to the projector chassis. Set you multimeter to continuity (or beep mode if it has it) or to OHMS to check for resistance. 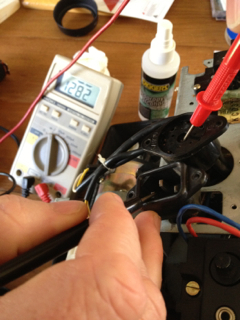 Put the probes as per the photos and the multimeter should beep or show almost zero resistance. That will tell us if two out of the three wires are okay from the power socket to the transformer.